Throughout the history of global mission work from churches within the United, States, beginning in the 19th Century, we have seen the great mission outreach organized for the most part by Mission Societies. In the 20th Century the mission work was taken over by church denominations. It became institutionalized. As we enter the 21st Century, we are once again experiencing a return to Mission Societies claiming a greater role in Christian mission work around the globe. It is in this climate of change, in how mission work is being done today, that the Friends of Madagascar Mission (FOMM) was begun. We believe we have a unique role in the future of mission, particularly in Madagascar at this time. In 2011 we began our fund raising activities and each year we continue to grow in giving from our generous donors. For this we give thanks to God! We are blessed to share an update from Pastor Andriamihaja Jean Norbert, the Coordinator of FOMM evangelists in the Betroka Synod of the Malagasy Lutheran Church. God is still at work! The setting for this story is among the Bara People. The work among them is very difficult. They are not only cattle thieves, but they are deeply involved in witchcraft and demon possession. This makes it harder to reach them with the Gospel. However, as Paul wrote, “And because I preach this Good News, I am suffering and have been chained like a criminal. But the word of God cannot be chained” (2 Timothy 2:9 NLT). The story of the village of Ambatomanga is a story of the grace and love of God toward the lost. Being a village of the Bara tribe and holding strongly to their costumes and culture, it seems impossible that 123 people would surrender their lives on one day to the lordship of Jesus Christ. But, there is not a heart so hard that the Gospel cannot break it down. The story of the village of Ambatomanga is proof that the Gospel is the power of God to save. 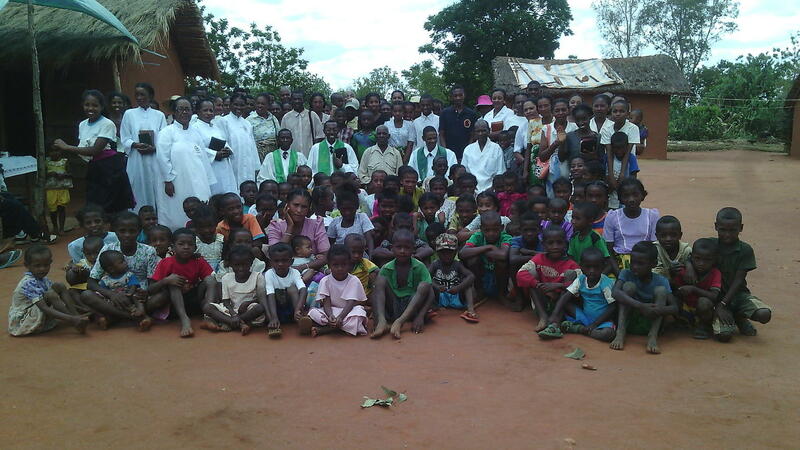 Two evangelists supported by Friends of Madagascar Mission: Jourmana Mananjary and Bruno Auguste first visited the Ambatomanga village together. Rema, a Bara man from Ambatomanga, was the first one to receive them and open the doors of the village to their evangelization. He prepared the meetings and the place for the evangelists to work. 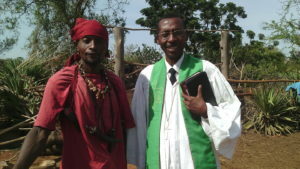 After the first visit, evangelists Jourmana and Bruno asked the Betroka Lutheran Church Synod to accept an invitation to support them in the work of evangelization in the village of Ambatomanga. On November 19th, 2016, the Betroka Synod president, Pastor Rasolondrazany Manoela, the leader of the evangelism department, Pastor Tomoera Alexandre, and Pastor Mara Jacob, together with 61 Lutheran Christians, went to Ambatomanga to visit and preach the Gospel to them. In the afternoon, they had worship and testimonial time about Jesus and what He has done in their lives. In the evening they showed the film, “The Final Judgment.” The film describes the last day of a person’s life and the judgment of God. The Bara people from the village of Ambatomanga, after seeing this film and hearing the preaching, started to repent and wanted to be baptized. The next day, November 20, 2016 we saw a great miracle and harvest. The seeds produced fruits. One hundred and twenty three Bara surrender to Christ. They were baptized. On the same day, the chief of the Malasos (chief of cattle rustlers) gave his life to Jesus. His name is Jean Claude. He is also the elder of the village. For now the work in Ambatomangais growing. After five months, the number of Christians is increasing. They are worshiping every Sunday morning below the trees, sharing the Gospel and being light among darkness. Because of this we sent an evangelist to live full time in the village and to teach and lead them, his name is Ralahimanana Hugo de la Patience. So glory, honor and power be to our Lord God, now and forever, Amen. Families, individuals and congregations may support an evangelist in Madagascar through Friends of Madagascar Mission (FOMM), a ministry partner with the NALC. The cost of support is $700 a year ($600 for salary and $100.00 for continuing education events). All sponsors will receive the name of an evangelist, a photo, normally one letter ay ear and at least one report of the evangelist’s work. The need is great. We have requests for around 50 additional evangelists. Why? Because the people are hungry for the Word of God. For additional information about the work of Friends of Madagascar Mission or to partner, please visit: www.madagascarmission.org. Next PostNext Ministry Matters: Polarization or Reconciliation?